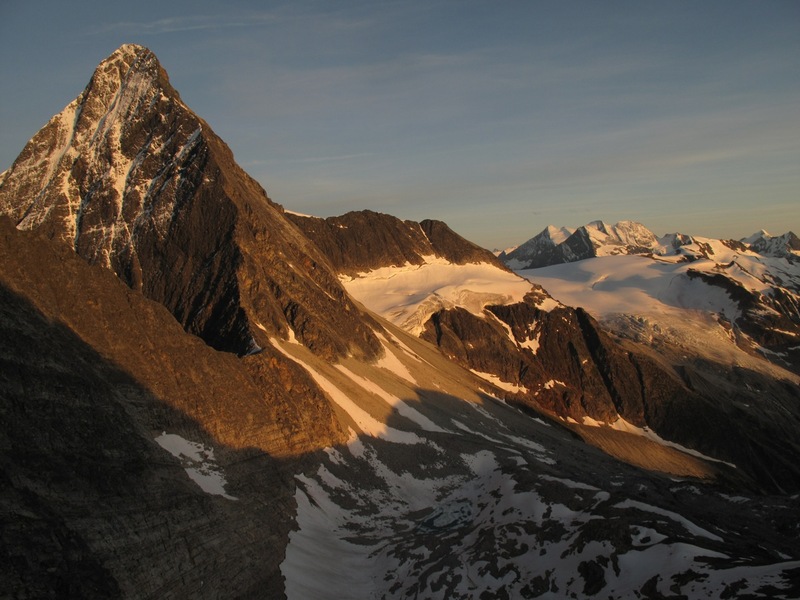 The peaks of Roger’s Pass dominate early mountaineering history in Canada. Most of the areas peaks were summited in the late 1800’s and early 1900’s by Swiss guides and Canadian Pacific Railway guests staying at Glacier Park Lodge. The first ascent of Mount Sir Donald, the tallest peak in the area, was completed in 1890. 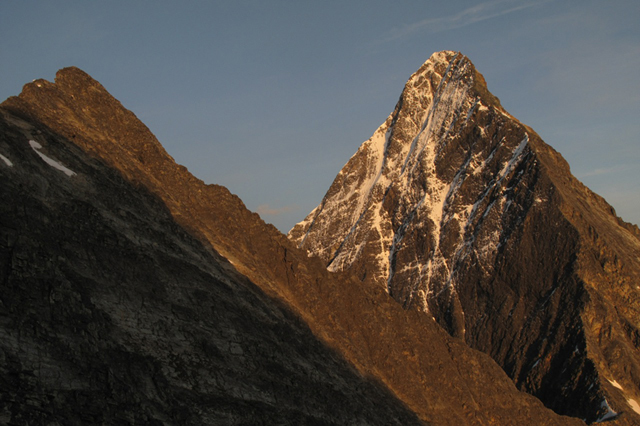 Sir Donald is an impressive and obvious Matterhorn shaped peak that towers above its neighbors. 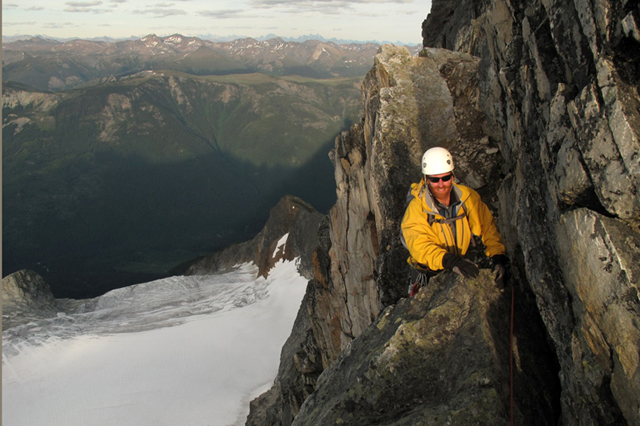 The Northwest Ridge climbing and mountaineering course has been idolized by the book “50 Classic Climbs of North America” and for good reason. 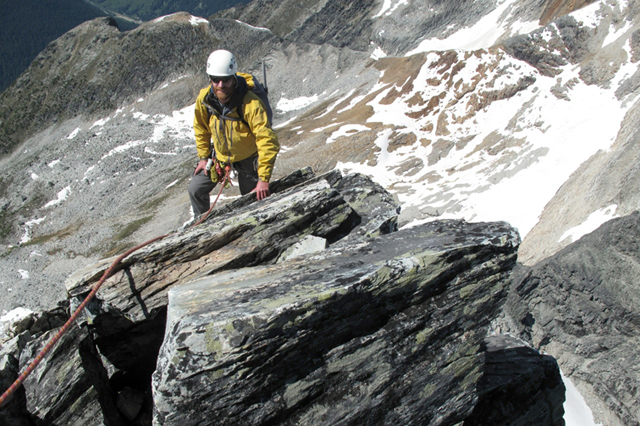 Along with the Northwest ridges’ impressive appearance, it is also home to solid and exposed alpine rock climbing with incredible views throughout the Selkirk’s, Purcell’s and Rockies. Day 2: With an early start we will ascend to the Uto/Sir Donald col and gain the NW Ridge. Steep blocky steps lead through exposed and exhilarating sections enroute to the upper section of the peak. The summit block provides the crux of the climb as it steepens and continues up the ridgeline. To descend we will retrace our steps down the ridge before leaving the ridge to rappel down the lower section of the West Face and return to our bivi site. Expect a 12 hour day. Day 3: After breakfast we will descend to the trailhead and return to Canmore. We can climb at one of the crags along the way if time and energy permit. Please contact our office to organize this trip as it is a 1:1 guide to guest ratio climb and is scheduled at your convenience. Maximum guide to guest ratio is 1:1. Our guides are enthusiastic and extremely talented. They hold certification from the Association of Canadian Mountain Guides and we are licensed to operate in the area by Parks Canada. Maximum group size is 2, minimum 1. Transportation is not included for this program. We will rely on guest’s vehicles to reach the trailhead. Canmore is situated 100km (65miles) west of Calgary on the Trans-Canada Highway. It is well served by scheduled bus lines both from Calgary (airport and downtown), Banff (20km west) and points further west. Calgary International Airport is well connected to major cities throughout North America and Europe. Vehicle rental is available both in Calgary and in Canmore. Frequent shuttles connect Calgary International Airport and Canmore. On the trail you will be staying in modern, lightweight 2-person weather-proof tents. Accommodation in Canmore is not included. A variety of accommodation options exist in both Canmore and Banff, including campsites, hostels, all levels of hotels as well as condo style accommodation with kitchens or suites. We recommend that you book your own pre and post-trip accommodations well in advance as all levels of accommodations in the Bow Valley fill quickly. Excess luggage can be left at your hotel or our office. All meals, snacks and drinks are supplied from lunch on Day 1 to lunch on Day 3. Mountain meals are made from lightweight ingredients. For guests with dietary restrictions, we are able to modify the program food pack to meet your individual needs. As food pricing and preparation for these diets is more costly, we have implemented the following surcharges. For vegan, gluten free, lactose free, soy free, nut free or any similar type of single restriction menu requests there will be a $16/day surcharge. For a diet requiring any 2 restrictions a $25/day surcharge will apply. For any 3 restrictions a $30/day surcharge will apply. Vegetarian meals will not be surcharged. For more complex diets our kitchen staff will assess the restrictions to inform you if the diet can be accommodated and what surcharge would apply. We supply group climbing gear such as ropes and hardware as well as group camping equipment such as tents and cooking equipment. You must bring your own personal climbing gear (e.g. harness, helmet, ice axe), clothing and general equipment. We can lend some personal items should you require. Make sure you let us know, in advance, what you will need to borrow. We suggest layers of light, easily carried clothing that allow for fast and easy adjustment to best suit fast changing temperature conditions. Cotton clothing is not appropriate as it causes rapid heat loss when wet. Feel free to call us if you have any questions about what to bring. 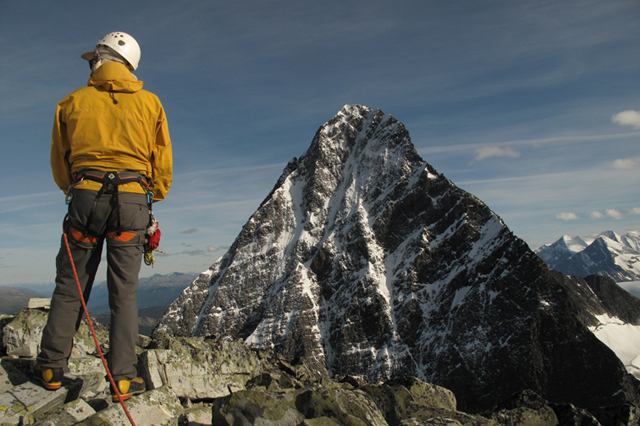 This list covers items needed for all likely conditions during the mountaineering season. Your guide will go through your clothing and gear with you prior to the course. •LONG UNDERWEAR (top and bottom) They should be synthetic such as Capilene or Merino Wool. •SOCKS. (2 pairs) They should also be synthetic/Merino blend. A good quality pair of socks goes a long way to preventing blisters! Some people like to use a thin liner sock underneath. •MIDWEIGHT FLEECE (top only) Some type of midweight top, whether it is a synthetic Polartec material or Merino wool. •INSULATED JACKET. This is essential for staying warm while taking breaks or when weather gets cold and nasty! •SOFT SHELL (Pants and Jacket) Softshell pieces have the advantage of offering great weather protection, while still being highly breathable. They can be worn for all but the wettest conditions. •WATERPROOF HARDSHELL (Pants and Jacket) A hardshell setup is essential for when the weather turns really wet. Because you end up carrying these around for a lot of the time, it is fine to pick something that is lighter weight. It is important for the pants to have a full length zip to fit over boots. Gore-Tex, H2NO or similar materials work great. •GLOVES At least 2 pairs. One should be a lighter weight fleece or soft shell material. The other pair should be warm and waterproof. •WARM HAT (that covers ears and fits under a helmet). •GAITERS In addition to keeping snow out of your boots, gaiters protect your pants from crampon points and reduce tripping hazard. You will need to bring: Some items available to rent from Yamnuska. Please inquire. •SLEEPING BAG – We suggest a three-season bag rated between -7 to -10 Celsius. Make sure you bring a stuff sac that will reduce your bag to its minimum size (i.e. one with compression straps) so you don’t use up all the room in your pack. •BACKPACK – Big enough to fit extra clothing, sleeping bag, and share of food. Internal frame packs are most comfortable and recommended. A 55-65 Liter pack is suitable. •DAY PACK – Big enough to fit extra clothing, equipment and your food for a day. A 30-35 Liter capacity is suitable. •MOUNTAINEERING BOOTS: You will need mountaineering boots with crampon compatible soles. As always, the most important feature of a mountaineering boot is comfort. Different brands seem to suit different feet. If buying, try a few different pairs and if they are not comfortable don’t buy them. There are many good brands. They include Asolo, Kayland, La Sportiva and Scarpa. •FIRST-AID Items (band-aids, ibuprofen & aspirin / Tylenol is enough as guides have a kit also). •TREKKING POLE (optional, must be collapsible). •EAR PLUGS for tent sleeping. We supply the following items, but if you have your own, please feel free to bring them; nut tool, belay device with pear shaped carabiner, 1 x 5m 7mm prussik, 1 x 20 cm sewn sling and 2 x locking biners. Please book as early as practical to avoid disappointment. Full payment is required at time of booking. We accept Visa, Mastercard, Electronic Transfers, Money Orders and Bank Drafts. Credit card payments are easiest, especially for international travellers. We ask that you review our detailed booking instructions and conditions. Please note that you will be required to sign our waiver before commencing the program. Please view our sample waiver copy. There are two basic types of insurance that most travelers need to consider: Medical and Cancellation/Trip Interruption Insurance. We offer our guests coverage for both and highly recommend you purchase it. It is wise to ensure that your health plan will cover you in case of illness or accident during your trip. Obtain extra coverage if necessary. There is no charge for rescue in the national and provincial parks, however costs such as air or ground transportation, long term care and other services are not covered. We recognize that our guests’ schedules may change for many reasons; business, family, flight delays, injuries and other unplanned events. For these eventualities the Trip Cancellation/Interruption insurance is a great way to protect your investment. For all your travel insurance requirements we recommend the Simpson Group. This agency offers a wide range of travel insurance options including Trip Cancellation/Interruption, Travel Medical and Personal Effect Loss for Canadian Travelers. Please note that this coverage is for Canadian residents only. For guests who are not from Canada and who are interested in the ‘Visitors to Canada’ insurance package please contact the Simpson Group directly at JSimpson@simpson-group.com and reference your Yamnuska Mountain Adventure’s trip. Private guiding options available. Please contact us to discuss this option. Trip Cancellation Insurance is available through the Simpson Group. Guests signing up for the Fast and Light ‘Sir Donald – NW Ridge’ ascent need to be in good hiking shape, be comfortable and efficient at seconding 5.6 rock and have had previous experience with multi-pitch alpine rock routes.